Get on board and renew your style and space with a decorative paint finish. Rich ivory and delicate celadon create a kitchen whose beauty is timeless. 1. Prime the surfaces with Fresh Start® Primer. Allow to dry. 2. Roll on the ceiling color first. Allow to dry. 3. Next, paint the cabinets. Allow to dry. 4. Roll on the wall color. Allow to dry. 5. Paint trim and allow to dry. Shades of red stimulate both the appetite and conversation, so it’s a perfect color family to explore for the dining room. Keep the feeling cozy by selecting a deep shade of red, not a bright one. 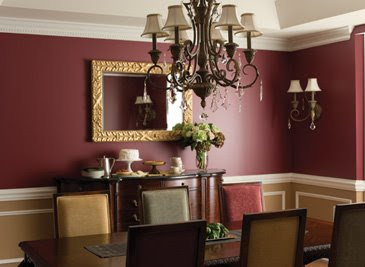 This Dining Room was painted at the top portion of the wall with a luscious rich, raisin tone, atop a wainscoting of golden tan which helps keep the deeper color from overwhelming the space. The ceiling and crown molding is soft white which visually extends the height of the room as well as highlights the detailed craftsmanship of the molding. Golden brown walls and a soft yellow ceiling form the perfect backdrop for the subdued golds and bronzes of the artisanal carvings, metallic silks, and textured embroideries in this alluring bedroom. Soft lighting and an intricate rug complete the look of luxurious tranquility. Just add incense, and you’re ready to leave the stresses of everyday life behind! Discover the adventure of color. Learn why and how colors work the way they do. 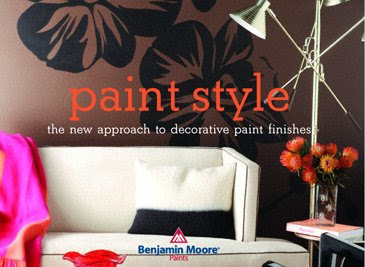 Keep pace with the latest trends and styles in color at Benjamin Moore Paints. When you explore color, you can create new color palettes for your own home that are exciting and unique. If you're not sure where to begin with color, experiment in a powder room or bathroom, a small hall or area between rooms, or an accent wall. If you're doing your own painting, pick an area that's quick to do so you can see your results sooner, and be happy with it or change it. Look at the process as an adventure. To get started, select a favorite color drawn from artwork, a rug, dishes and an accessory or furniture piece as a main color or accent. When selecting a color, consider the mood of a room. In a bedroom do you want the feeling to be restful and soothing or dramatic and intimate? Soft, cool colors and neutrals usually create a quieter feeling while stronger colors are for drama. Do you want a dining area to feel sociable and stimulating or appear formal and quiet? Warmer, contrasting and somewhat brighter colors add to a sociable atmosphere; deeper blue-greens and neutrals will give a more formal ambiance. Boost your confidence by testing colors on poster board or large areas of a wall. Don't be afraid to go beyond your comfort zone: Consider strong, vivid colors or soft, deep neutrals like chocolate brown or olive green as main or accent colors. Or add drama with a stronger color on the ceiling. Tinted ceilings can dramatically change the whole look of a room. A small color wheel is a great reference tool for modifying and intensifying two or more colors. For example, red and green, which are complementary (opposite) colors, are most intense when used together. You may be surprised at how many combination's function beautifully together, and you may even become attracted to entirely new color palettes. The color wheel also illustrates the visual temperature of a color. Draw a line from the yellow-green mark on the color wheel all the way down to the red-violet; you'll see that all the colors on the left are warm and the colors on the right are cool. Think one color is boring? Create bold or subtle variations within one color group with contrasting paint finishes. For example, use closely related colors, or try a single color in different finishes, for walls and trim in one space. For an accent color, select a warmer (more toward reds) or cooler (more toward blues) color to complement your main color group. For a quieter ambiance, make sure your colors are not extremely bright. White or an off-white tint can be a striking accent when used as trim with a monochromatic color group. These pointers were written by Barbara Jacobs at hgtv...I agree! Now that homeowners no longer obsess about how much their homes have increased in value in the past week, they're reacquainting themselves with the joys of home ownership from a new, healthier perspective. Recognizing that larger is not necessarily better and that less can actually be more, many homeowners are looking for ways to make the homes they're in more useful, comfortable and enjoyable. Show your true colors. "Paint is the cheapest and most powerful thing you can do to put your personal stamp on a home. Paint your home the colors you enjoy living with, the colors you feel happiest within. Frank Harrelson is the owner of the local Matthews Paint Store, a Benjamin Moore franchise. He is recognized as one of Charlotte's leading experts in color selections. Frank," Knows What Women Want", he can be contacted at 704-844-6818. The pale green cabinets set against the warm cream walls, gives the space an expansive feeling. The darker green of the ceiling balances out the visual weight of the base cabinets, while the soft white trim quietly outlines the bank of windows. Classic white counter tops and stoneware complement the kitchen’s clean, simple lines. 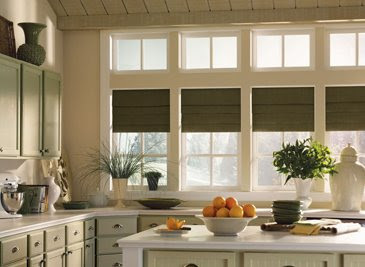 Pleated Roman shades and accessories such as the dinnerware, vase, and platters in deep olive work as monochromatic accents while the bowl of oranges adds a citrus burst of refreshing color. Fresh fruits and vegetables are a creative and inexpensive way to accent a room with color, and work particularly well in kitchens. Here, we’ve paired a single fruit, oranges, in a solid color container for strong visual impact, but experiment with keepsakes and containers to create an appealing color accent that expresses your own special style. The just released Paint Style from Benjamin Moore is a glorious book to guide you in transforming your home with paint, whether using a brush, roller, sponge, or cloth. With more than 180 exquisite images illustrating how to create various tonal effects, faux appearances, patterning and textural designs, Paint Style instills imagination and confidence to interpret your style in a whole new fashion. Benjamin Moore’s experts cover every possible detail to ensure picture-perfect results. From mottling and color washing to strie and stenciling, they provide clear instructions for each technique, plus build upon the basic “lesson” showcasing compelling effect created by layering techniques or changing the palette. The ideal guide for creating custom designs, choosing colors along with the right brushes, and tools of the trade.